At the British Film Awards this month, the Harry Potter films will receive an award for "Outstanding British Contribution to Cinema." The entire 8 film series is quite an achievement. The first film, Harry Potter and the Sorcerer's Stone, was unleashed to the public in 2001, before the final three books were even published. 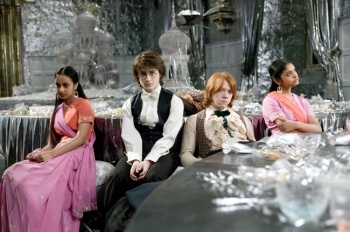 The cast has remained consistent throughout in part because, author J.K. Rowling's contract stipulations for selling the rights to the series to Warner Brothers demanded that the actors all be British. The rule has stayed largely in place, with concessions made for European characters in The Goblet of Fire, and producer David Heyman was instrumental in keeping the faith. Both Heyman and Rowling will be honored with the award at the Orange British Academy Film Awards on February 13th. "As this great British film success story draws to a close with this year's eagerly anticipated final installment, it's fitting that BAFTA honors the Harry Potter films and their contribution to the British film industry," said Finola Dwyer from BAFTA. David Heyman said he was accepting the award "on behalf of the over 2,000 people who worked in front of and behind the camera on each of the Harry Potter films." He thanked them for all of their work before expressing gratitude to the woman behind Harry Potter. "Thank you to Jo Rowling for entrusting us to bring her magnificent books to the screen." The award, introduced in 1978, has previously been given to British filmmakers like Mike Leigh, Kenneth Branagh and Working Title Films (The Big Lebowski, Mr. Bean). What the Harry Potter films have achieved is staggering when you realize the scope of the project. An 8 film series produced within ten years with the same cast, tracing their growth from grade school to adolescence and beyond. Not even Jackson's Lord of the Rings could match the breadth of what the Harry Potter films have accomplished in the Oughts. Not to mention that the movies have made almost $6.3 billion worldwide, and that's without the last film that's set to hit theaters on July 15th. Yeah, I'd say that's pretty outstanding.